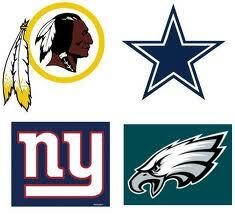 Today we begin to look at the NFC and start with the NFC East. The Cowboys have taken a lot of grief about their draft. I don’t have a problem with the player they picked. What I have a problem with is how the team manipulated the draft. They had the #18 pick and they traded down with the 49ers to pick 31. That part is good, they need players, so accumulate picks, I get that. However, the team they were trading with had a ton of picks and all they got was a 3rd round pick, # 74 overall. It was a sellers’ market and I would have gotten at least one more pick from San Francisco to make the swap. Picking up help in the interior of the offensive line was a must for the team and they must have believed that Frederick would not be around with the 47th pick. Tony Romo has been running for his life and needed someone that could do a simple shotgun snap. Frederick is a typical Wisconsin offensive lineman, tough and nasty. So did they reach? Maybe, a little bit, but I can understand if they got the guy they wanted. I think the Cowboys offensive line is already better and that’s was a priority in this draft. Gavin Escobar was a little bit of a head scratcher as well, but again, I can understand the logic. Escobar won’t blow you away with measurables. He’s not real fast or strong, but what he does do well is catch the ball. Not only has Romo been running for his life, but when he does put the ball in the receivers’ hands, they drop it. The team needed someone other than Jason Witten that can hold on to the ball. Escobar will give Romo another target he can trust. I expect the Cowboys to use more two tight end formations and when Witten eventually retires they have his successor. I think Cowboys fans breathed a sigh of relief with the pick of Terrance Williams. Williams is a big receiver that can stretch the field. He led the country with over 1,800 receiving yards in 2012. He uses his height to go up and catch the ball at its’ highest point. The addition of Escobar and Williams should give Tony Romo improved targets to work with. J.J. Wilcox was one of my favorite small school players in this draft. He is an extremely athletic player that played running back, receiver and corner before settling in at safety. Wilcox has good size and he is a smart player that reads routes well. Don’t be surprised if Wilcox doesn’t make a push to start at free safety. B.W. Webb is another small school player who created a buzz at the Senior Bowl. He plays with good technique and knows how to knock the ball away from a receiver without getting flagged. Webb can also return punts and had a 30 yard return in the Senior Bowl. Joseph Randle is a versatile running back that can help in all phases of the game. His running style has some wiggle to it and he is good at juking defenders. Since DeMarco Murray has trouble staying healthy, Randle should be able to get on the field. DeVonte Holloman is an extremely athletic linebacker. He played a hybrid linebacker/safety position for the Gamecocks. Holloman has good speed and is very disruptive. If Holloman can make the team, I think he could see some action in the dime and nickel packages because of his speed and athleticism. All in all, I think the Cowboys improved their team. Their biggest need was the interior offensive line, which they addressed. I thought they would also look to get defensive linemen since they are switching from a 3-4 to a 4-3, but they must have liked what they had. Justin Pugh is a versatile lineman that could play right tackle or guard for the Giants. He has good feet, good balance and moves well laterally. Pugh has the movement skills to get to the second level and block linebackers in the run game. Ideally, he may not have the arm length to play on the left side, but he can play any of the other line positions. Pugh will start off in a battle with David Diehl and James Brewer for the starting right tackle spot. Diehl is starting his 11th year and he may end up as a backup that can play pretty much any spot that is needed if a starter goes down with injury. Johnathan Hankins is big and powerful with sneaky agility and athleticism. He is a player that dominates at times but doesn’t have a consistent motor. Hankins knows how to utilize his size to his advantage and should be able to help the Giants run defense and be part of a rotation behind starters Cullen Jenkins and Linval Joseph. Damontre Moore was a 2nd team All-American and 1st team All-SEC selection in 2012. He was third in the SEC with 12.5 sacks and 21 tackles for loss. Early in the process he was viewed as a top 5 pick, however his draft status plummeted when he only ran a 4.95 40 yard dash and only had 12 bench press reps at the NFL Combine. Many people questioned his work ethic. At 6’4” 250 lb. player should have been stronger and faster than he showed. Another question was that his size seemed to favor a linebacker, rather than defensive end, but you want a linebacker to be faster and more athletic than he showed to be. The good news is that the Giants already have Jason Pierre-Paul, Justin Tuck, and Mathias Kiwanuka, so Moore should be part of a rotation that will allow him to only play in special packages and develop slowly. If he is allowed to only concentrate on getting after the passer, I could see him making a contribution to the team. Ryan Nassib is a very smart 4 year starter for Syracuse. As with most of the QB class, some people loved him and some people hated him. Nassib has surprising athleticism, is mature and has a good work ethic. He has good composure in the pocket, nice footwork and anticipates routes well. Nassib is a gym rat that should be a sponge, soaking up knowledge from the coaching staff. With Eli Manning as the starter, he should have time to get coached up and unless there are injuries should not have to see the field for a while. Cooper Taylor has very good size and deceptive athleticism. He is a big hitter and should fit right in with what the Giants like to do defensively. He will initially be a backup and special team’s player. Eric Herman is a strong, physical player that was known for his pancake blocks. His 36 bench press reps were tops among offensive lineman at the NFL Combine. Herman will provide depth in the interior of the offensive line. Michael Cox is a running back with decent size and not a lot of mileage on him. He is a one year starter that rushed for 710 yards his senior year. The Eagles offensive line was hit hard by injuries last season. Left tackle Jason Peters lost significant time due to injuries. He will return this year, but the right guard position was also a concern. The Eagles drafted Lane Johnson, possibly the most athletic big man in the draft. Four years ago, Johnson was a quarterback and is now a tackle with good movement skills. Johnson will likely take over for Todd Herremans at right tackle, allowing Herremans to shift over to right guard. Any time you can make one draft pick to improve two positions, you have done a good job. Johnson’s athleticism should fit in well with Chip Kelly’s super-fast, high octane offense. Zach Ertz was my top rated tight end. He was the key to the Stanford passing game due to a lack of consistent wide receivers. Ertz moved around all over the field and Kelly will love his versatility. Whoever ends up as the starting quarterback, will also love his hands and dependability. He is a guy that makes the tough catch and he always seems to get yardage after the catch. Ertz will team with Brent Celek and James Casey to give the Eagles 3 big receivers that can move around and bail out the quarterback. Bennie Logan will back up Isaac Sopoaga at the nose tackle position and should be able to be part of a rotation to keep both players fresh. The Barkley pick was a head scratcher. Ryan Nassib was still available when the Eagles picked Barkley. On the surface, Nassib would seem to be a better fit for the offense that Kelly ran at Oregon. This makes you wonder what type of offense Kelly will run in Philly. The zone read is not Barkley’s cup of tea, so maybe Kelly’s offense will be more of a west-coast passing attack. Right now the Eagles have Michael Vick, Nick Foles, Dennis Dixon and G.J. Kinne along with Barkley on the roster. Each quarterback has a different skill set, so it’s going to be really interesting to see what the Eagles offense looks like. Earl Wolff is a big safety that does a good job in pass coverage. He can use his size to go up and get the ball at its’ highest point. He will start off backing up Patrick Chung and Kenny Phillips, but I can see him getting some playing time in nickel and dime packages. Joe Kruger is another in the list of football players in the Kruger family. His brother Joe was part of the Ravens team that won the Super Bowl and then got a big pay day from Cleveland. His other brother, Dave, was also signed as a free agent for the Browns. Joe Kruger is an active player that creates havoc for opposing defenses. He will begin his career backing up Connor Barwin and Trent Cole at outside linebacker. Kruger is a high effort player and should be able to do well in nickel and dime packages and contribute on special teams. Jordan Poyer is a player that won’t blow you away with his physical skills, but he is always around the ball. He has good ball skills and has the versatility to play all over. Poyer has experience in both man and zone schemes and should be able to cover slot receivers. Even though he’s a 7th rounder, don’t bet against this guy making the team. David King was a defensive tackle at Oklahoma, but he will play defensive end in the Eagles 3-4 scheme. He is a bit of a tweener that has played both inside and outside. One of the reasons for him slipping to the 7th round is a lack of hustle. He will have to up his game to make it at the next level. The Redskins did not have a 1st round pick due to the trade up last year to get RG3. The Redskins biggest need was in the secondary and they drafted three players to address that area. David Amerson made a name for himself in his sophomore season when he led the country with 13 interceptions. His junior season was not as good and at times was beaten badly causing him to fall to the 2nd round. Playing corner is all about confidence and Amerson was beaten badly on a couple of occasions in the first game against Tennessee and it’s possible that he just lost his swagger. If Amerson can recapture the form he had as a sophomore, he could be a Pro Bowl caliber corner. Jordan Reed is an extremely athletic tight end. In 2010, as a redshirt freshman, he split time at quarterback with Trey Burton. In 2011, he was moved to tight end and became a 2nd team All-SEC selection in 2012. The Gators moved him all over the field, taking advantage of his athleticism. He even got some carries as a running back. Reed is a smooth player that gets in and out of his breaks well and creates difficult matchups for the secondary. He has drawn comparisons to Patriots tight end Aaron Hernandez (also a former Gator). Fred Davis is recovering from a torn Achilles’ tendon, so if he is slow to come back, Reed could get lots of playing time early in the year. Phillip Thomas was a 1st Team All-American in 2012 and led the country with 8 interceptions. He has great ball skills and does a good job jamming receivers in man coverage. Don’t be surprised if Thomas doesn’t end up the starter at free safety in week one. Chris Thompson was injury plagued at Florida State, but if healthy could be a very explosive, big play back for the Skins. He has sprinter’s speed and has an ability to catch the ball out of the backfield, along with returning kicks. Mike Shanahan has a knack for hitting on backs later in the draft, so this could be another of his hidden gems. He will start off behind 2012 rookie sensation Alfred Morris, Evan Royster and Roy Helu, but his ability to return kicks could get him onto the field early. Brandon Jenkins was rated as a possible 1st round pick until he suffered a Lisfranc injury in the first game of the 2012 season. Prior to the injury he was a natural pass rusher that was quick off the ball and had a very good speed rush. Jenkins will be asked to convert to outside linebacker and it’s possible the Redskins could stash him on the injured list or practice squad for one year to let him develop. Bacarri Rambo is a ball hawking safety that led the SEC with 8 interceptions in 2011. Rambo was suspended for the first 4 games of 2012 for a positive drug test and his play dropped off a bit after that. He is a hard nosed player that comes up quickly in run support and is not afraid to deliver a blow. Rambo will start off backing up Brandon Meriweather, but if he can stay clean off the field, his versatility could get him some significant playing time. I know it may sound like a cop-out, but Jawan Jamison reminds me a lot of Ray Rice. Both players went to Rutgers and have similar builds. They both have good feet and are tough runners between the tackles. He is not real fast, but he can do anything you need him to do. This entry was posted on May 25, 2013 by draftmaniacs in Draft Analysis and tagged 2013 NFL Draft, 2013 NFLDraft, Dallas Cowboys, David Amerson, Florida State football, Gavin Escobar, Jordan Reed, Justin Pugh, Lane Johnson, Matt Barkley, New York Giants, NFC East, NFL, NFL Draft, Philadelphia Eagles, Ryan Nassib, Travis Frederick, Washington Redskins.